Directions: Located in the rolling chalk downlands close to Epernay (the capital of the Champagne producing region of north-eastern France). Châtillon-sur-Marne is a commune in the Marne department in north-eastern France. It lies in the valley of the Marne River, surrounded by the Parc Naturel de la Montagne de Reims. It lies in the historic province of Champagne. The picturesque village stands above sloping vineyards and fields. The photograph was taken from a picnic area on the side of the D1 main road at the end of June, 2015 offering wide open vistas which are truly representative of the beauty of this location. I used a Nikon D800 with a 24-120 f/4 lens at 24mm, ISO 900, f/13 at 1/800 sec. Summer is probably the best time to visit with many hours of sunshine to ripen the grapes. Rain of course can occur at any time in this part of the world. 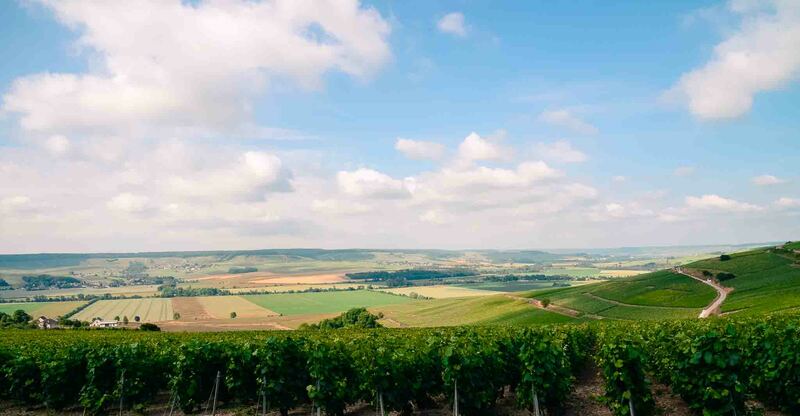 The Champagne region is an easy drive of around 1 hour 30 minutes by rental car from the main airports at Paris or 2 hours 30 minutes from the Channel Tunnel or ferry ports of northern France and there is plenty of hotel accommodation and world class wine to enjoy.